For over seven centuries, the Old New Synagogue has been the principal synagogue for the Prague Jewish community and stands as the oldest surviving structure of its kind in Europe. The building has undergone several phases of remodeling, but what stands today is still the original synagogue which was finished in 1270 and constructed in the Gothic style. This synagogue was preceded by another called the Old Synagogue that was demolished in 1867 to construct what is now called the Spanish Synagogue. Initially known as the New or Great Shul, it acquired the name Old New Synagogue in the 1500’s when other synagogues were built. 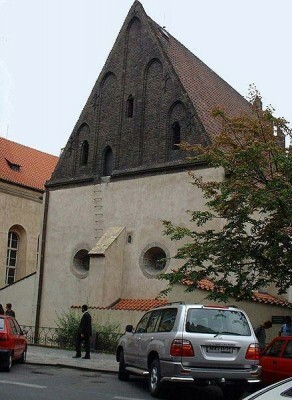 The Old New Synagogue is said to have been built by stone masons from the royal workshop. It is quite remarkable that the synagogue remains intact after several horrendous massacres and gutting fires. The synagogue has remained an active center of worship for a very long time. A towering single-story structure, the Old New Synagogue was constructed in the orthodox Jewish style. This means that there is a central prayer chamber for men and a surrounding colonnade for women. Many synagogue artifacts are present including the Torah ark, scrolls, lecterns, chandeliers, symbolic sculptural motifs and many more. In the nave of the synagogue hangs a red flag with the Star of David and a 15th century Jewish hat in the middle. The exterior of this rectangular medieval structure has thick outer walls and a sizable saddle roof and gothic gables. The Old New Synagogue is an interesting place worth visiting.